Rohingya Muslim terrorists in Myanmar killed dozens of Hindu civilians during attacks last August, according to an investigation by Amnesty International. The killings came in the first days of an uprising against Burmese forces, who are also accused of atrocities. 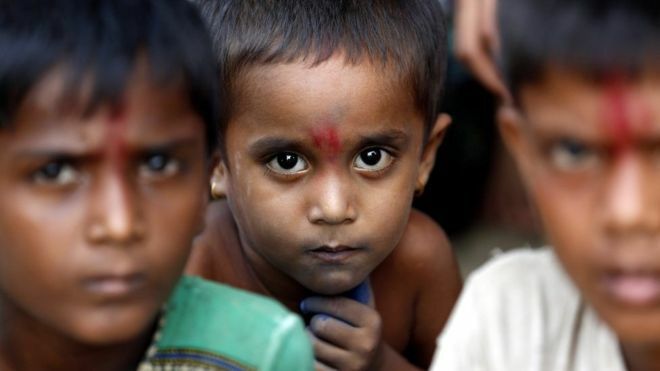 Since August nearly 700,000 Rohingyas and others have fled the violence. The findings also show ARSA was responsible for violence against civilians, on a smaller scale, in other areas. The report details how ARSA members on 26 August attacked the Hindu village of Ah Nauk Kha Maung Seik. ARSA terrorists are accused of killing 20 men, 10 women, and 23 children, 14 of whom were under the age of eight. Amnesty said the bodies of 45 people from the village were unearthed in four mass graves in late September. The remains of the other victims, as well as 46 from the neighbouring village of Ye Bauk Kyar, have not been found. But the victims were not Muslims – they were Hindus, killed, said the government, by terrorists from ARSA. Journalists were taken to the site to see the grave and the bodies. However the government’s continued refusal to allow independent human rights researchers into Rakhine left lingering doubts about exactly what happened in the village of Ah Nauk Kha Maung Seik, and a neighbouring village, Ye Bauk Kyar. The Rohingya – a stateless mostly Muslim minority – are widely despised in Myanmar, where they are considered to be illegal migrants from Bangladesh, despite the fact that some have been in Myanmar for generations. Bangladesh also denies them citizenship. HinduPost was one of the few news outlets in Bharat which covered the genocide of Hindus and other ethnic minorities of Myanmar last year in Rakhine (Arakan) state at the hands of ARSA and other Rohingya Muslim fanatics. Most of our coverage was dismissed as “fake news”, the usual response of the liberal-secular lot when confronted with facts that upset their pre-decided worldview. This brutal violence and the attack on Myanmarese border Army outposts is what triggered the military crackdown leading to the Rohingya Muslim exodus, a fact conveniently hidden by the Islamists and secularists who twisted the narrative into a one-sided tale of Muslim persecution. It is mind boggling that a organisation like Amnesty International took 10 months to conclude that mass killing of Hindus did take place, when there was copious amounts of evidence including video testimony of survivors just a few days after the killings. 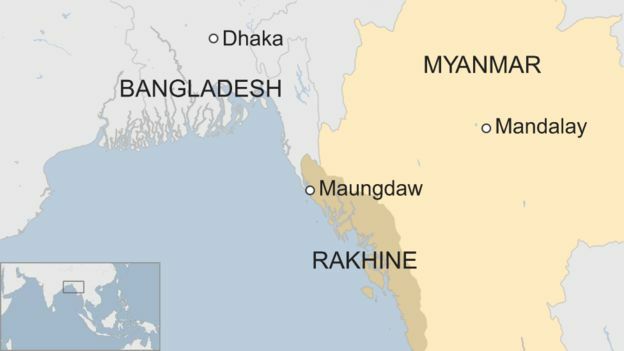 At the time of this disturbance, Amnesty and the entire Western establishment was focused solely on the exodus of Rohingya Muslims, and no one really bothered to listen to what the Hindus and other minorities living alongside the Rohingya Muslims in Rakhine state, and especially Maungdaw township, had to say. It was not just ARSA terrorists, but large mobs of Rohingya Muslims that attacked their Hindu, Buddhist and other ethnic Arakanese neighbours. The survivors were so terrified that they pleaded the Myanmarese Government to resettle them separate from Muslims. Apart from the 99 Hindus, ARSA terrorists killed 14 Arakanese Buddhists, 13 Mro ethnic people, 5 ethnic Chakmas/Daingnet, 15 members of government security forces, and 3 civil servants. Some Hindu women were abducted, forcefully converted to Islam and taken across the border to Bangladesh, before they were rescued by Hindu groups in Bangladesh. Amnesty International & BBC are claiming “new evidence” has convinced them about the massacre of Hindus at the hands of Rohingya terrorists, but this evidence was right there all the time. When BBC says “government’s continued refusal to allow independent human rights researchers into Rakhine left lingering doubts”, what it means is that a human rights violation can be confirmed only when a Western human rights researcher says so. The Myanmarese groups, local Hindu organisations and Myanmar-based news outlets like The Irrawaday who were giving first-hand reports of the massacre of Hindus, all pale into insignificance in front of an Amnesty or USCIRF ‘investigation’. Around the time of the massacre, Wagle only RT'd a HuffPost article stating that Hindus were merely "caught in the crossfire between Myanmar's military and Rohingya Insurgents." But howsoever late, the recognition of what the Hindus of Myanmar suffered, is welcome, and one hopes that international attention now also turns to what Hindus in Bangladesh, Pakistan and parts of Bharat like West Bengal, West UP and Kerala are suffering.